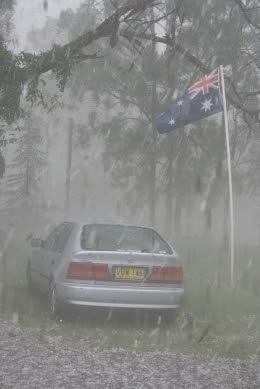 Baino's Banter: All Hail Aussie Weather! Today it was warm, 30C, humid and from about 3:00pm there was the distant rumbling of approaching thunder. Enough to make Lily seek refuge wedged between the couch and the little side table. Enough to warn us to get the washing off the line. Enough to advise that there would be a welcome relief to the heat in the way of a summer storm. About 4:30 ish a mighty sweep of wind came billowing in from the north west, the rain began to drive at about 45 degrees and we had hail . . . not just nice little bouncy bits of ice but hail . . golf ball sized hail . . .it was quick, it was hard, it was deafening on the car port roof, violent and it was all over in 10 minutes, leaving nothing but an eery steamy haze over the garden as the heat evapourated these giants. To give you an idea, Clare and Fringelet were watching this in their bikinis . . it wasn't cold although the water produced by melting hail was. It was HOT. After the storm, it's now about 28C, overcast and humid. There is still ice in our valley gutters and against the laundry wall. This country is weird when it comes to weather. Yesterday we had the flood! Today at 11am it is 2°C! But we have this strange object in the sky - I think you call it the sun!! The SIZE OF THOSE HAILSTONES!!! The strange weather is on account of you being on the wrong side of the world. If God had intended us to live on the wrong side of the world he would have put us there in the first place. Nothing good can come of spending your whole life standing upside down and having your calendar wrong all the time. Just when I catch up with what is happening on Sunday, you are on to Monday. It is no wonder you are always winning the cricket, the Poms don't even know what day it is. Brilliant photos. 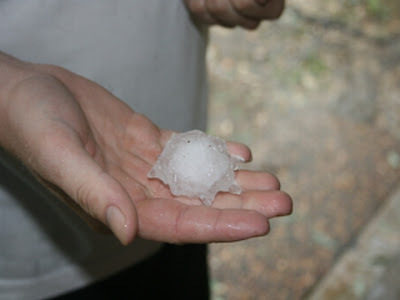 I remember hail like that in Sydney, cars had dents on them, lots of damage to properties etc. Despite having 340 days of clear sunny skies the weather can get weird as you say. 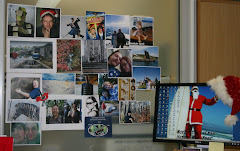 Still, miss it lots, much more than I thought I would before coming to Ireland. Was there any damage around this time? Well all, yes we have warm rain and the Corolla has a few dings in the roof. The hail was too 'violent' to permit ClareBear to move it undercover, it all happened really fast. The Fringlet's family lost their pergola and TheMerry Widow has three smashed skylights but not much damage at Kellyville Farm other than the odd leak and lots of squished gum leaves - they were well pulverised to the point that the air smelled of eucalyptus! As it is bitter cold here I don’t have any sympathy for you, but it sure was pouring.